Eyewitnesses from Dryden to Brandon and as far south as Duluth, Minn., have reported seeing the object. Ufology Research of Manitoba, a Winnipeg-based independent centre that collects data on Canadian UFO reports, is assisting the museum in gathering eyewitness accounts to determine the object's flight path. Spokesman Chris Rutkowski said he's received more than a dozen calls so far. 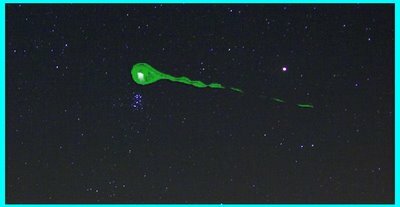 "They all report seeing a brilliant blue or green light moving through the sky with a long tail," he said. "There may have been somebody who captured it on a cellphone camera." Young said the end point of the object's flight path is somewhere in northwestern Ontario. It's not known whether any pieces reached the ground. "The first step is to figure out the trajectory and where pieces might come down," he said. "If it's a reasonable place to go looking, then we'll look for pieces," he said.